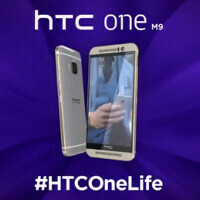 Check out this commercial for the HTC One M9 in the U.K.
HTC has started running a 30-second ad for the HTC One M9 in the U.K. No, Robert Downey Jr. isn't anywhere to be found in this made-for-TV commercial. Showing kids running around a museum with the HTC One M9 in hand, we are supposed to get the message that the manufacturer's new handset is fun and that wherever you go with the device, a good time follows. Out of all of the possible features on the phone that HTC could have focused on, the kids at the museum are shown taking a picture of the occasion. That gives viewers the impression that the good times with the One M9 (as memorialized in a picture) will last forever. And it also shows off the new 20MP rear snapper on the device. The rear camera on the previous two flagship models had been criticized for not showing enough detail. HTC responded by moving the 4MP UltraPixel camera found on the back of the HTC One (M7) and HTC One (M8) to the front, and adding the improved camera to the back of the HTC One (M9). The ad then shows a suit-wearing roller skater with the HTC One M9 in his hand. Out of place as he skates around the crowd, he unsurprisingly receives the stares of those around him. But HTC says "Let Them Stare," which really refers to the beautifully designed flagship phone in his hand. We are then transported to a party taking place and HTC puts up the phrase "Make Some Noise," which is a reminder that the One M9 carriers the front-facing stereo BoomSound speaker system. HTC has admittedly struggled with the marketing of its flagship phones. Does this ad make you want to buy the HTC One M9? In the U.S., pre-orders have started today with the device launching on April 10th. What? HTC One M9 in the market here in Middle East and I saw people using it already. I think i am better off with the M8. ya right, I guess you don't remember that Sammy phones are notorious for blown up batteries, heat issues...for a refresh google it, they are well documented. HTC know how to make phones but there ads are always awful. The need a new marketing manager. Should have spent that marketing money on the camera.